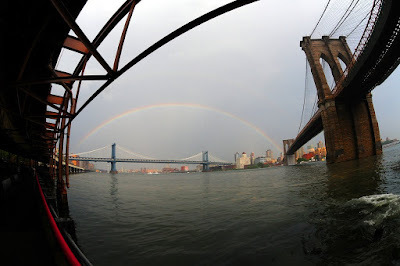 dietrich over on flickr captured this great picture of a rainbow last week that we saw driving east over the Brooklyn Bridge. Minutes before there was an absolutely torrential downpour that my family was caught in. I love walking in the rain and getting soaked so I convinced my wife that it was going to downpour for hours. To my wife's dismay, shortly after we made it to the car, it stopped raining. At least this rainbow on the way home cheered everyone up. If you look closely you can see two rainbows. dietrich, by the way, puts out some wonderful shots around NY.